Get a Better Signal - Check out our new and easy-to-use Cell Phone Signal Booster Solution "Guide Me Wizard"
Established in 1953, RCS Wireless Technology has grown into one of the largest two-way radio shops on the East Coast providing sales, service and installation of many Safety, Security and Communications related products such as Two-way radios, cell phone and public safety signal boosters, mass notification systems, paging systems and video camera systems to name a few. RCS Wireless Technology also manufactures the Call24 Wireless Call Box Systems. 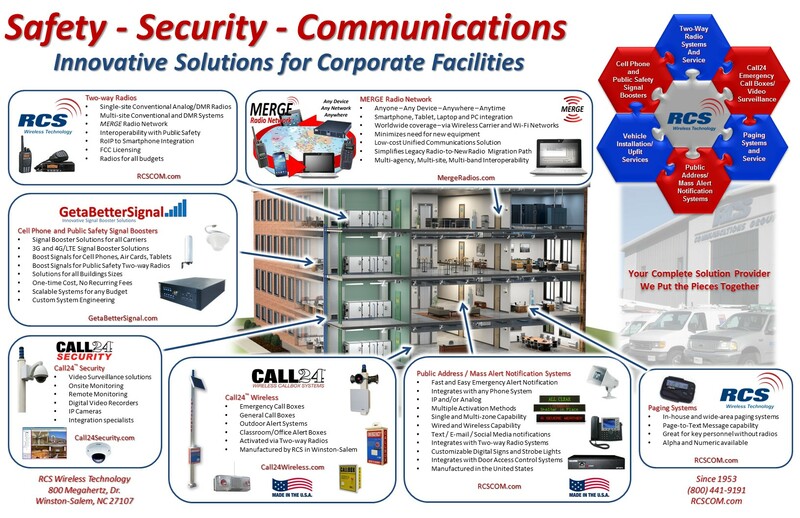 With over 60 years of Safety, Security and Communications related experience, RCS Wireless Technology has thousands of satisfied customers across the United States. Click the image above to see just some of the Innovative Solutions we provide to our customers. Not everything is shown, so if you don't see something you need, then call us anyway to see if we have it available.